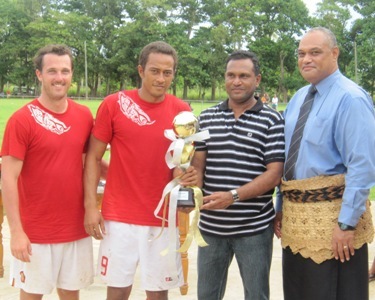 Loto Ha’apai Premier team on Saturday regained their title, with an emphatic 2-1 win over Marist to maintain an undefeated record during the season. The first goal came in the 28th minute from a set play with a through pass from midfielder, Kilifi Uele to striker, Lafaele Moala, who took a solo run and did a placed pass into the goal mouth leaving the keeper out of position. Marist captain and keeper Kaneti Felela equalized halfway through the second half from a penalty kick in front of the goal to keep their hopes alive. Over a thousand supporters were kept in suspense as the two battled out the pitch, and saw a handful of brilliant saves from Marist’s Keeper, Felela. But Loto Ha’apai fans were rewarded 3 minutes before the full time whistle when Kilifi Uele found a good finish in front of the goal with placed kick pocketed into the far corner of the goal, sealing a 2-1 victory over Marist and reclaim supremacy. Loto Ha’apai women’s team also gave Marist a tight match to claim the womens division’s title, while Veitongo defied Popua in a match that spilt oevr to extra time with a 1-0 victory, making them this seasons champions. 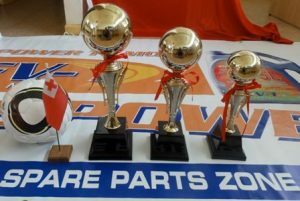 The 2010-2011 Spare-Parts Zone Major League season kicked off in October 2010 with seven (7) Premier teams, twelve (12) teams in Division one (1) and another seven in women’s division.